Keeping Women out of Prison coalition are calling for a review of sentencing laws and practice for women to better address the negative impact on children and families. In a Position Statement revealed today, the coalition are calling for more investment in proven diversionary programs for mothers and their children serving shorter sentences, to help reduce the increasing population of women in prison. NSW Premier, The Hon. Gladys Berejiklian, recognised the only way to better support women in the justice system during the process and after is to embrace innovation. ‘We need to do things differently’ said the Premier. 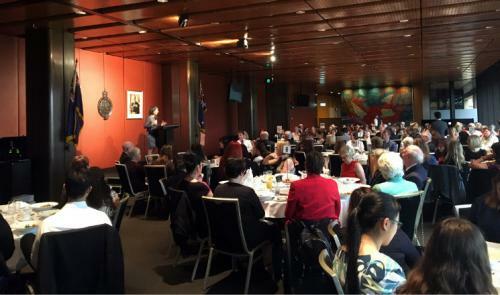 Keynote speaker, The Hon Graham West, argued how women’s pathways to custody differ from men. ‘Women’s contact with the criminal justice system is often characterised by social and economic dependency connected to violent and abusive relationships and addiction,’ he said. Bravely taking the lectern, Dee*, now an 18 year old university student, described the challenges of being separated from her mother at age thirteen. Taking responsibility for bill paying, feeding her two younger siblings, and navigating public transport to visit her mother. Dee described her relief when they discovered the support of SHINE for Kids who arranged transport to visit their mum and school holiday activity days at the prison where they could share time together. ‘She has supported me through the years of her absence,’ Dee said. A former inmate, Andrea*, described her experience of being separated from her children for her sentence. Determined to turn her life around, Andrea studied while in custody, having to move prisons to complete her placement. Now in full employment, Andrea advocates for more support for other women in prison. Keeping Women out of Prison Coalition is led by Sydney Community Foundation’s Sydney Women’s Fund in partnership with the Zonta Club, The Miranda Project, SHINE for Kids and Women’s Justice Network and By My Side fund. The Keeping Women out of Prison position paper advocates for nine recommendations for reducing women’s incarceration. Download ‘Keeping Women out of Prison’ position statement update here.